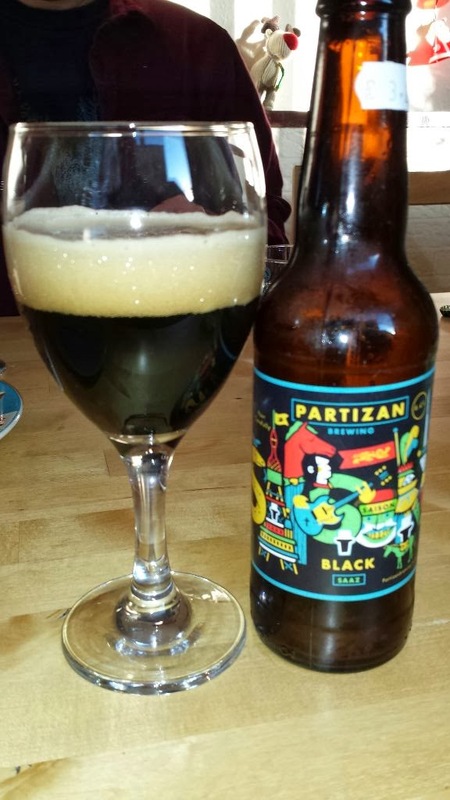 Partizan is a London brewery that took over the old Kernel brew kit when Kernel moved on to a larger system. I don't know a whole lot about them other than that and I believe this is the first beer of theirs I have had. Black Saaz is supposed to be a black saison. It seems like the in thing these to make a black version of every beer style out there. Personally I think it's often a wasted effort on the part of the brewer. If I hadn't been told that this was a black saison, so in other words a blind taste test, I would have failed and called it a porter. At least at first anyway. It starts off with a slightly spicy aroma with coffee and molasses as well as a slight yeasty quality. Moving on to the taste I thought it was a straight up porter with a little peppery quality but with big yeasty notes too. It wasn't until the beer was near room temperature that it started to resemble a saison as I know it. As far as I'm concerned, the purpose of a black version of a pale beer is to be almost indistinguishable from its pale counterpart, otherwise a black IPA is just a hoppy porter or a black saison ends up being a yeasty porter. It's a lovely beer in its own right but I fail to see the point. On to Weird Beard now, another of London's many breweries. 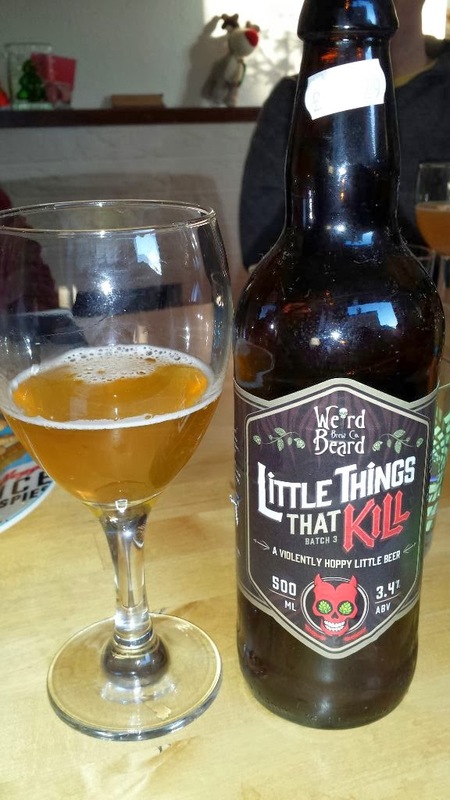 Little Things That Kill (batch 3) is a low alcohol American pale ale. It's only 3.4% so the perfect session strength and it's just wonderful. Now let's be clear, this isn't a complex and balanced beer. It's fizzy hop juice but it's delicious fizzy hop juice. The batch number is key here because each batch uses different hops, though the malt base is supposed to be the same. Batch 3 used nelson sauvin (personal favourite) as well as centennial and cascade. I loved this beer and would certainly drink it again. 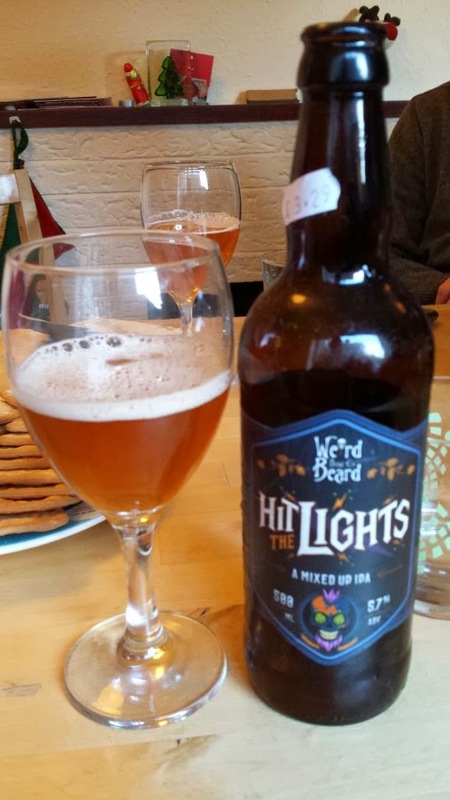 Also from Weird Beard is Hit The Lights, a 5.7% IPA. I must admit that I wasn't a fan of this at all. There was a sort of oxidised aroma and odd flavour but it wasn't actually oxidised from what I could tell, it just tasted odd. A little fruit but not much going on that interested me. It was either a dodgy bottle or I just didn't like it very much. 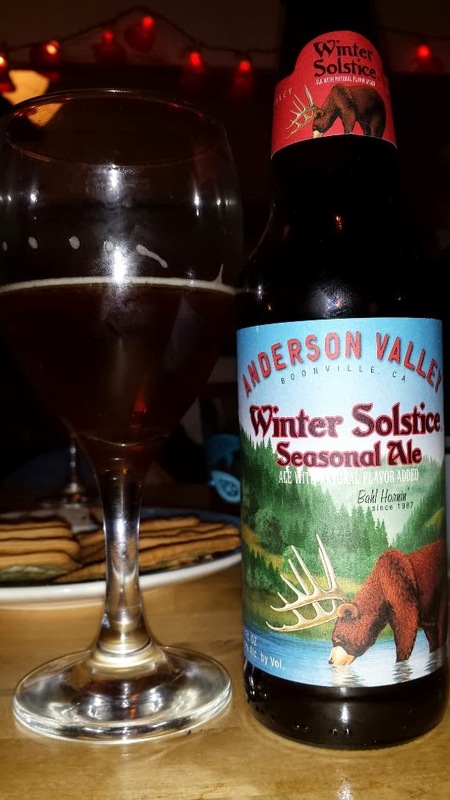 This bottle of Anderson Valley Winter Solstice seasonal ale was a Christmas present from Drinkstore when I picked up my last beer order before Christmas. The beer itself is a little on the bland side but it's very nice. It's all about the malt with quite a nutty quality and some slight spice. Not a bad beer and one I had a few years ago, I just thought Drinkstore worthy of a mention for their gift. 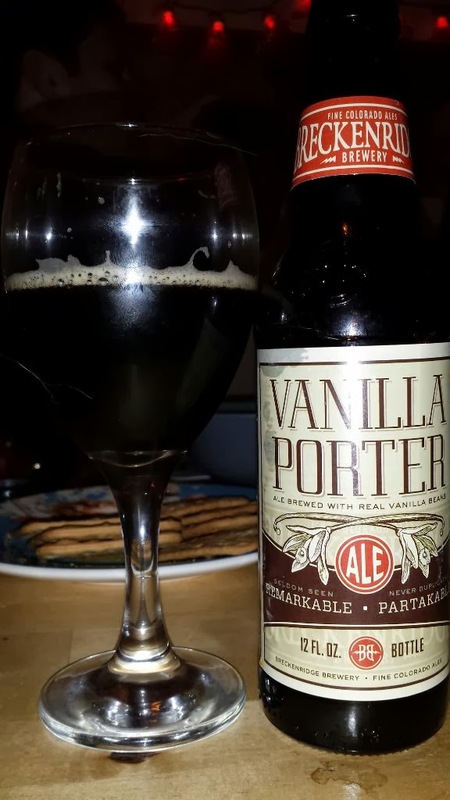 Breckenridge Vanilla Porter is a bit of a sup par porter in the bottle in my opinion. I've had it before on tap and it was a lot better. 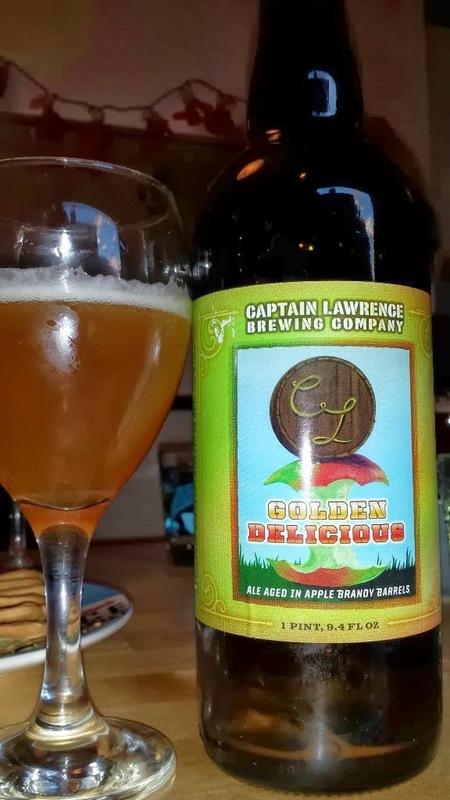 Captain Lawrence's Golden Delicious is a very odd beer. It was barrel aged in apple brandy barrels and is an 11% American tripel. Apples in beer is usually seen as a pretty bad thing and to be honest, this is no exception to that rule. I simply don't get the appeal here, it tasted fake. Don't get me wrong, there is nothing fake about this beer but the apple brandy and vanilla is so overpowering that it just doesn't taste like a beer. 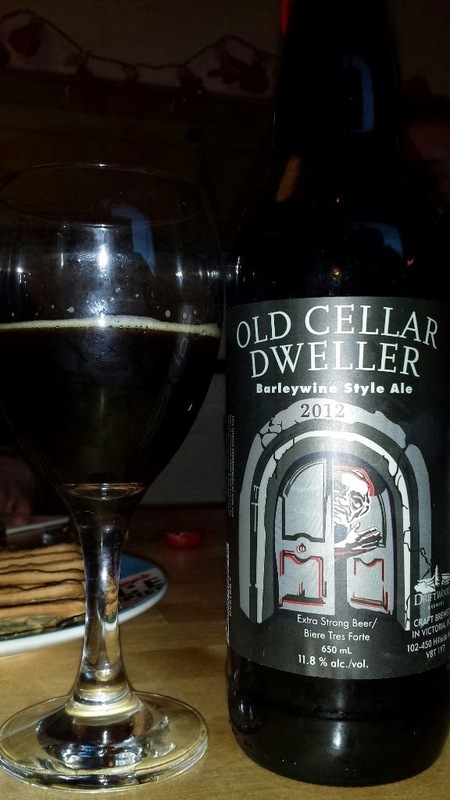 Old Cellar Dweller (2012) from Driftwood Brewery is an 11.8% barleywine. An aroma of molasses and strong malt as well as dark fruits. On tasting I was hit by a real port quality. There was a fair bit of bitterness with a long warming alcohol finish. I found it to be a lovely beer. 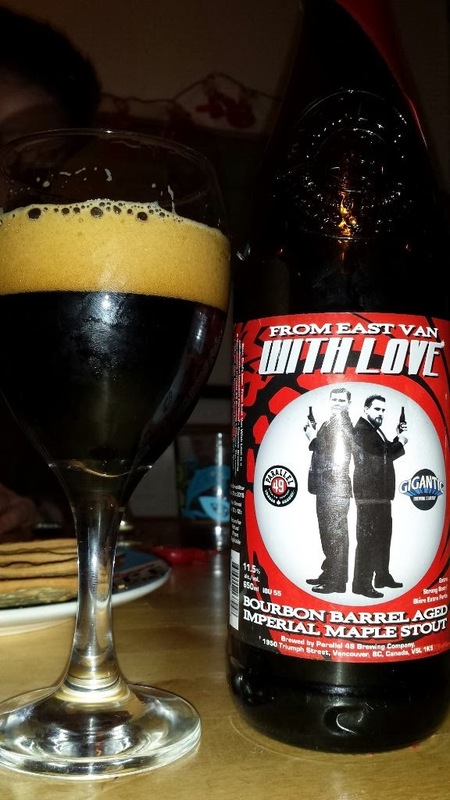 The Parallel Brewing Company in Vancouver collaborated with Portland’s Gigantic Brewing to produce From East Van With Love. This is an imperial stout but it also has maple syrup in it. Adding maple syrup to beer is not something I find necessary or desirable in a beer. It's also barrel aged so I got a fair amount of oaky vanilla as well as maple syrup and warming alcohol. I actually found the beer very pleasant but couldn't escape the feeling that the maple syrup wasn't doing anything more than make we feel I should be pouring the beer over pancakes. 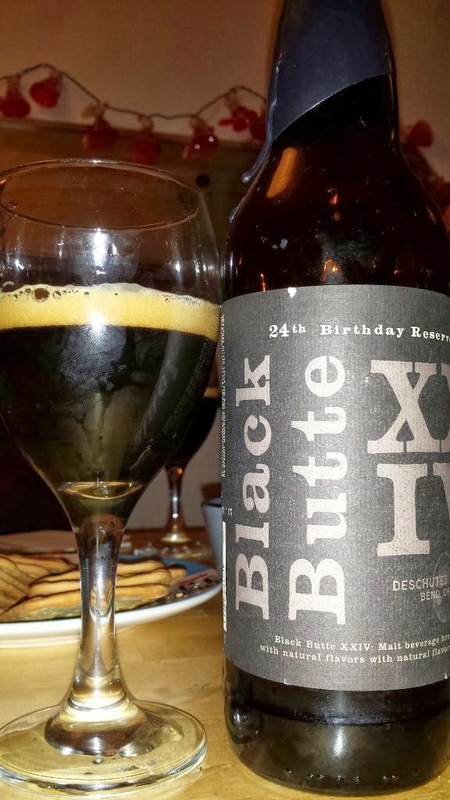 Back Butte IIIV from Deschutes in Oregon is an imperial porter. This is the 24th birthday edition which has added dates and figs. From what I can tell, this was a one off brew in 2012 and has been ageing nicely for the last 3 years. An aroma of rich chocolate, slight alcohol and some stinky cheese. Once tasted, the cheese was lost in the huge dark fruits and rich dark chocolate. I'm not entirely sure what the figs and dates did for the beer but the overall impression was moreish. I loved this beer from start to finish and only wish I had more. 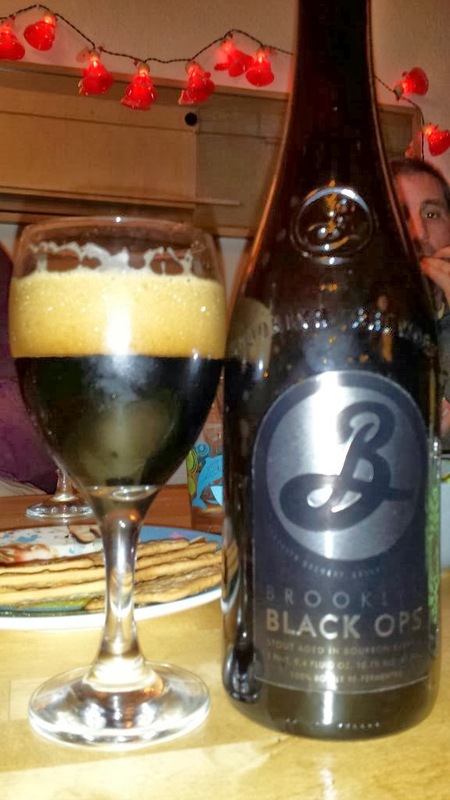 And finally to Black Ops from Brooklyn. It's a 10.7% Russian imperial stout and it's absolutely beautiful. Bursting with vanilla oakiness and some smoke as well as dark chocolate and fresh roast espresso. There's a real bourbon quality here and while it does dominate the beer, it never moves in to the seemingly fake barrel aged flavours that some whiskey or bourbon barrel aged beers can become if the whiskey notes become too much. Unlike most imperial stouts, this was finished with Champaign yeast so is rather effervescent. An excellent beer although I think I preferred Black Butte above.